Wildfires scorch Southern California’s hills in December 2017. 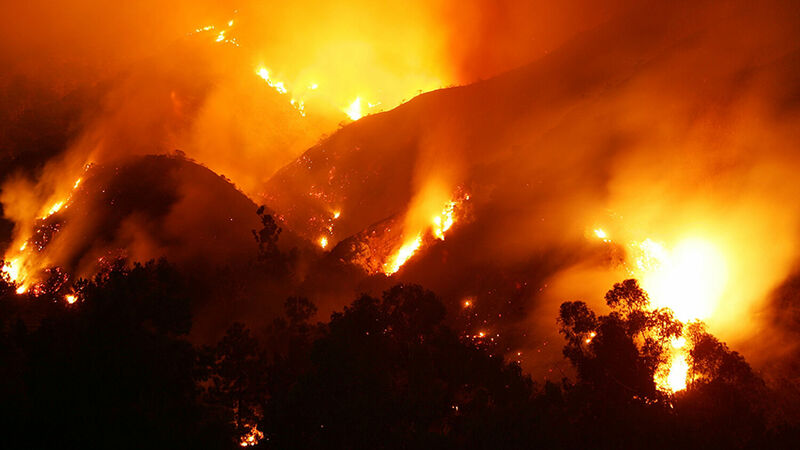 Wildfires have scorched Southern California this week, and they aren’t letting up. 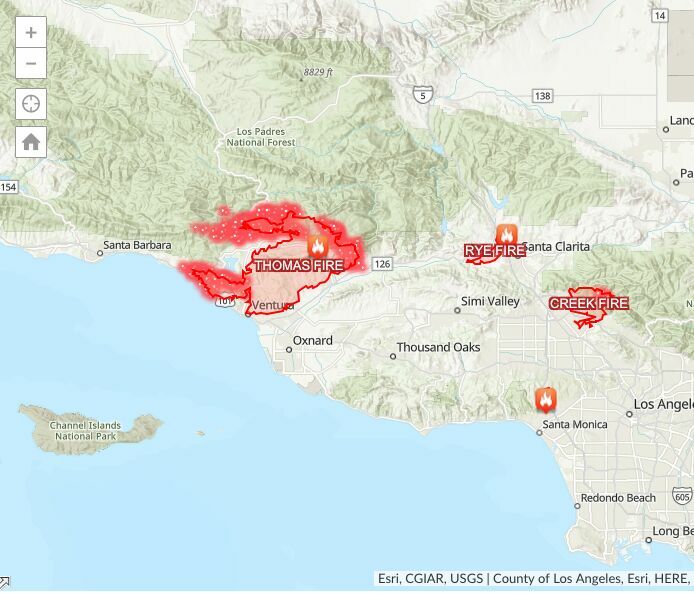 A swath of new wildfires has once again lit up Southern California. Even before this week’s fires, 2017 had already been the worst wildfire season in California history. The fire trail began Monday with the Thomas fire in Ventura County; this blaze has now been deemed the largest and most destructive wildfire in Southern California. It has scorched 140 square miles, more than 90,000 acres. Strong Santa Ana winds have fueled the fire, which has threatened thousands of homes, requiring mandatory evacuations for more than 27,000 residents. At minimum, the homes have lost power—many were completely destroyed. “The burn area is pretty much all the mountains between Ventura and Ojai and extending east to Santa Paula,” said Ventura County Sheriff Sgt. Kevin Donoghue. “It’s a challenge because of the enormity of it, and it’s a challenge because it’s pretty rugged terrain.” Power outages affected water pressure and supply, making it impossible for firefighters to pump water from the hydrants. According to CalFire, the Thomas fire is only 5 percent contained. Two other fires, the Rye fire and the Creek fire, have sprung up since Tuesday and started engulfing the San Fernando Valley. The Rye fire has burned more than 7,000 acres; the Creek fire, more than 12,600 acres. Early Wednesday, the Skirball fire ignited near the Getty Center, reaching homes in Bel-Air, a wealthy Los Angeles suburb. The fire skirted along the edge of Interstate 405, temporarily shutting down the nation’s busiest highway. On Wednesday, the winds were predicted to reach up to 80 mph. By that evening, 475 acres had been engulfed by the flames, forcing the evacuation of 700 Bel-Air homes. God … says it is a sign that we are living in the very last days. Weather disasters, as they increase in frequency and intensity, are actually fulfilling Bible prophecy. They are among the signs that Christ gave pointing to the end of this present evil age. Christ gave specific signs to watch for leading up to His return. In Matthew 24:7, Christ prophesies that “famines, and pestilences, and earthquakes, in [different] places” will afflict the world. 2017 was marked by earthquakes, tornadoes, hurricanes, floods, wildfires and terrorist attacks. The world is being violently shaken by God—He is trying to get people’s attention! Weather disasters, as they increase in frequency and intensity, are actually fulfilling Bible prophecy. They are among the signs Christ gave of the end of the world we now know—and the beginning of a beautiful new world we can hardly even imagine. Notice the hope that is in this message! In 2 Chronicles 7:14, God promises to “heal their land,” but that is dependent on the people’s repentance of their sins and wicked ways.